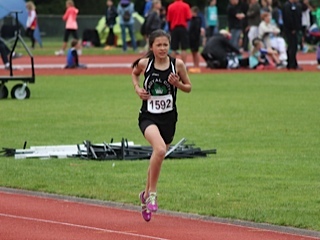 Representing their schools, six Royal City Track and Field Club JD athletes set out to compete against hundreds of elementary-aged competitors at the BC Elementaries’ Meet in Richmond May 24th. A meet highlight for RCTFC athletes was Amanda Scott’s silver medal in the 13 year old girls’ category for her performance in a competitive 800m race! Scott took the lead early in the final lap and fought off her competitor until the final 125 metres of the race. Congratulations also to Jeremy Belcher, Shea Janke, Lauryn Savela, Michelle Dadson and Milena Kalisch for their successful competitions at the Elementaries’. RCTFC athlete Amanda Scott, shown here competing at an earlier trackmeet, won silver for her 800m performance at the Elementaries’ trackmeet.